The reasons why employees book direct are many. Norm Rose and Bing Liu at Phocuswright uncovered some interesting findings about the rise of the smartphone as a driver of this shift in behavior. Most corporate travel managers will agree, though, that there’s a need to support off-channel bookings in at least some circumstances — conferences, special events, customer-funded travel, or even to hire and retain the best talent. Off-channel bookings are here to stay and most would agree that they’re on the rise. The core challenge remains — they’re still a blindspot. How do you understand your booking blindspot? While travel suppliers are being more innovative these days, only a handful have made sharing employee booking data with corporations a priority. The responsibility for understanding the blindspot falls completely on the corporate travel manager. Tracking off-channel booking activity starts with simply discovering that a booking has been made. Most methods used are sadly manual and include receiving booking emails from travelers, maintaining shared spreadsheet files, and even hallway conversations. Does this sound familiar? Supplier-direct integrations such as Concur TripLink sound good, but the fact is that they are expensive and time consuming for suppliers to implement. As a result, rollouts have been slow and coverage remains quite low. Additionally, a solution like TripLink doesn’t help non-Concur customers. The ideal solution to achieve a complete understanding of the critical off-channel blindspot would combine both automatic capture of off-channel bookings as they are made, as well as deliver complete coverage across all suppliers and support clients regardless of what booking tool, expense application, or TMC they may use. Traxo FILTER solves this challenge of understanding off-channel bookings. It is the first product on the market that provides corporate travel managers with truly comprehensive visibility into their total program spend, and does so in real time. Traxo FILTER ensures virtually any off-channel travel booking will automatically be captured, no matter how, or where, it was booked. How does Traxo do this? Traxo FILTER’s patent pending technology integrates directly into a company’s central email server (Microsoft Exchange, Office 365, and Google G Suite supported). 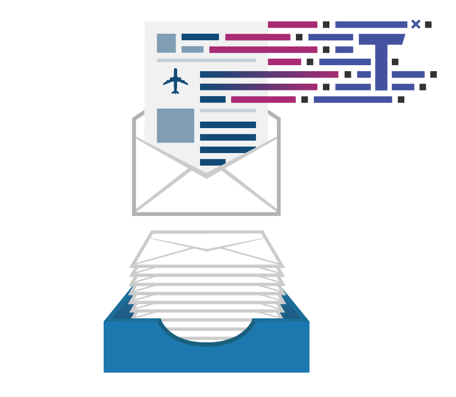 When a travel confirmation or hotel folio email is detected by the server, it’s flagged for processing by Traxo and the data made available to the corporate travel manager through an online dashboard, or integrated into a company’s expense, reporting, duty of care, or TMC tools. Additionally, because Traxo FILTER is controlled by the client’s IT team or email administrator, it’s highly secure — there is never any third party accessing your emails. The Traxo FILTER rule set is configurable by the client, and is fully trackable, auditable, and transparent. Best of all, it can take as little as 20 minutes to install. The days of requiring employees to manually send in their booking confirmations and maintaining out-of-date spreadsheets are over. Traxo FILTER is available now as part of a Traxo CONNECT subscription. Sign up today and get rid of your booking blindspot!